This soup dish is inspired from those large canned chunky beef soups you find in the supermarket, like what I had said before I like making proper meals out of what I see in supermarket ready-made dishes, this is no different. So on my next supermarket visit I grabbed a can, looked at the photo, confirm ingredients at the back and cook it at home which will definitely taste and look better than its canned counterparts, it will be preservative free as well. Not sure how this type of soup originated but I always see it in supermarkets since I was a child, so for this post I guess let’s look on how the soup in general was invented. During the early days boiling was not a common cooking technique until the invention of waterproof containers like clay vessels which happened 9000 years ago, that is why the earliest evidence of soups existence can only be found as far back as about 6,000 BC. The word soup came from the French word “soupe” which then came from the Latin word “suppa” which means “bread soaked in broth”. But during the early days it was not called soup yet and believe it or not it was initially called “restaurant” which means “something restoring”, this word was used to describe a type of soup sold by street vendors which is concentrated and inexpensive, it was advertised as cure to physical exhaustion. Then in 1765 someone opened a shop that specializes in that type of soups which in turn prompted the use of the modern word restaurant to describe the shops. Then the rest is history. Now for this post it will be a really chunky and simple soup made out of beef and pumpkins, a really good complete meal especially during wet and cold winter nights like what we have here now. In a pot sauté garlic and onions. Add stock and tomato paste, bring to a boil and simmer for 35 minutes in low heat. Add corn and celery, simmer for 10 more minutes. Add pumpkin, pasta, carrots and dissolved flour. Simmer for additional 15 minutes. Season with salt and freshly ground pepper then serve. Sounds delicious for Autumn or Winter evenings… It’s so hot here all I want to have now are salads, vinegared cold fish dishes etc.. 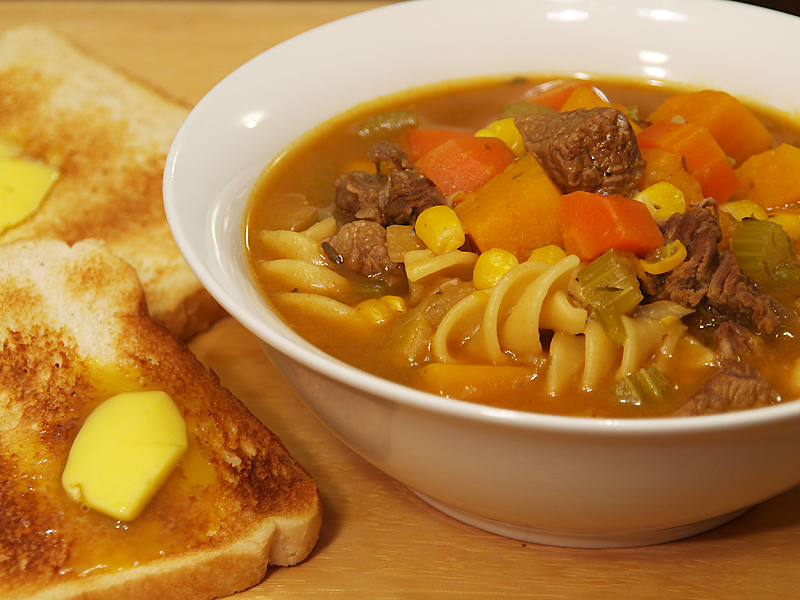 This hearty soup is perfect for the very cold and wet weather we are having at the moment. I bet it’s a thousand times better than the canned too. Looks wonderful. Delicious soup and am sure will be great with chicken without the beef. Dipping the bread inside will be heaven Raymund. My hubby loves these type of soup for his evening meal. Mmm this looks yummy! Usually people only make pumpkin soup around here during the fall, so I haven’t heard about it in months! How delicious… I really miss soup dish. San Francisco has been sort of cold for summer and I am totally feeling for soup instead of ice cream (stop making it already – too cold!). I’d be so happy eating this pumpkin soup. What a comforting feeling I get from this soup. By the way…I’m not sure if you have noticed, but your blog link was completely slipped off from my blogroll. Sorry if you have felt “left out”…I didn’t meant to… Just letting you know. 😉 I have something to pass on on my blog next week. I’ll let you know! I really like chunky beef soup but never have I paired it with pumpkin. I absolutely love this pairing. You always have great recipes here.. I love it. hearty soup, perfect for the rainy weather in Manila! Looks good! What a unique combo! Was just surfing looking for inspiration to use a pumpkin I was given and came across this wonderful recipe. Can´t get hold of the beef here, but I am sure I can adapt!